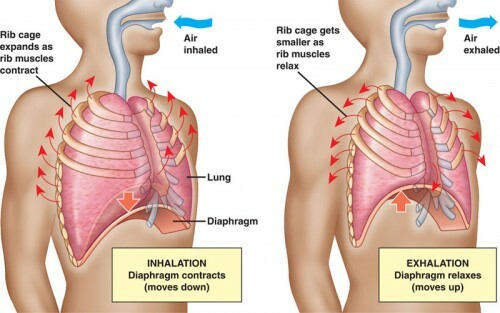 The diaphragm in the respiratory system is the dome-shaped sheet of muscle that separates the chest from the abdomen. It is also referred to the thoracic diaphragm because it’s located in the thoracic cavity, or chest. It is attached to the spine, ribs and sternum and is the main muscle of respiration, playing a very important role in the breathing process. The lungs are enclosed in a kind of cage in which the ribs form the sides and the diaphragm, an upwardly arching sheet of muscle, forms the floor. When we breathe, the diaphragm is drawn downward until it is flat. At the same time, the muscles around the ribs pull them up like a hoop skirt. The chest, or thoracic, cavity becomes deeper and larger, making more air space. The two parts of the diaphragm are the peripheral muscular and central aponeurotic parts. The peripheral muscular part is made up of muscle fibers that converge on the central tendon, or the central aponeurotic part, which is a thick, flat plate of dense fibers. The peripheral muscular part is separated into three parts: the sternal, costal and lumbar. The sternal part is made up of two muscular slips that are small and attach to the back aspect of the xiphoid process. The costal portion is made up of muscular slips as well, but these are wide and come from the inferior six ribs' internal surfaces and costal cartilages, interdigitating with the slips of the transversus abdominis muscles. The lumbar portion comes from the lumbar vertebra by two pillars called the musculotendinous crura. These pillars attach on both sides of the aorta.